Within minutes of landing in Des Moines you know that you have arrived in the American Midwest. The Midwest is the straight man of the Western world, millions and millions of square miles peopled with Abbotts without their Costellos. It’s not that Midwesterners lack a sense of humor; it’s just that they regard humor as second-rate behavior, the opposite of, rather than a complement to, seriousness. It’s no wonder that professional Midwestern humorists—Garrison Keillor, David Letterman—have the feel of men who have spun out of some orbit. 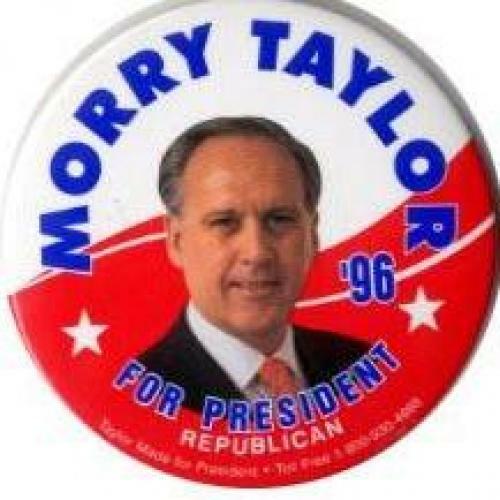 I’ve come to Iowa to find Morry Taylor, the man who by a landslide won the hearts of the United We Stand delegates at Ross Perot’s convention last fall. (After hearing him speak, 400 of the 2,000 people present signed up to work on his campaign.) Taylor has spent his entire life in the Midwest and counts as the only bona fide commercial success story out of the nine candidates in the Republican field. He started out as a tool and die maker, attended Michigan Tech and in the early 1980s, in his mid-40s, after a career selling wheels for farm equipment, began to buy distressed tire and wheel plants and turn them around. Today he is the chief executive of Titan Tire and Wheel International, which finished last year with $620 million in revenues, no debt and one of the highest profit margins of any company listed on the New York Stock Exchange. The strange thing about Taylor is that he hasn’t gotten more play in the press or the polls. He’s the real thing: an extremely successful businessman who has behaved about as well as an extremely successful businessman can. He employs 5,500 people—1,200 of them in Des Moines—at a wage rate of $12 to $17 an hour, all of whom are included in a profit-sharing plan. He pays himself a modest salary and argues forcefully and often that CEOs of publicly held corporations should never be paid more than about twenty times the wages of their most menial workers. Actually, that’s probably one of the reasons no one has heard of him until now. “Why do they call you the Griz?” I ask, after he hangs up. It seems the natural next question. Morry then shouts back at Lenny, an extremely resourceful young man whose job is to race around sorting out the chaos that Morry creates wherever he goes in Iowa and New Hampshire. There’s some shuffling in the back of the land yacht. “I’m not sure,” says Lenny. “I’m on about the same as Dole,” says Morry. “Dole and I are on the most ballots.” Which is true. Although Morry’s strategy is to focus on Iowa and New Hampshire (“If I win Iowa, New Hampshire’s mine, too”), the United We Stand people have created a truly national organization for him. And while the other marginal candidates in the field—Alan Keyes and Bob Dornan—are running to win their 2 or 3 percent of the vote, which they can then cash in like chips in a casino for prestige and appointments, Morry has no interest in anything short of total victory. He is also the only candidate who is the least bit persuasive when he says he has no interest in being president for more than four years. “Why the hell would I want to do that?” he says. “I like my life.” And he does. At 9:00 the land yacht rolls up beside the front door of the Ames High School and disgorges Morry. Morry then does his usual trick of startling the locals. He bursts through both double doors leading into the school, which, like all the doors he will open for the rest of the day, slam violently against the wall behind them. He marches off down a long corridor with the rest of us trying to keep up, leaving a trail of startled adolescents in his wake. He swaggers like a quarterback on the way to a huddle. “Did you play sports in high school?” I ask Morry, or rather, the back of Morry’s head. He doesn’t even look around. He’s shaking his head; I have no trouble imagining the scorn on his face. My question is plainly ridiculous. “Did I play sports?” he asks. “I am the biggest jock who ever ran for president. I can beat you in anything.” And with that he blows through the double doors leading into the auditorium. High school probably was not prepared for Morry Taylor the first time he passed through, and it most certainly is no match for him now that he’s sitting on $40 million-plus of Titan stock and a fully fueled presidential campaign. About thirty kids file in, slump down into their seats and settle in for a snooze they’ll never have. The students are now fully alert. “I never could enjoy going to a school like this,” concludes Morry. The kids seem to concur. With that he reaches into his pocket and produces a fat roll of $100 bills. He holds it high so that everyone can see. Five grand. Cash. The kids are now perched on the edge of their seats, giggling nervously, probably wondering what they feed presidential candidates. “Can I have some?” asks a kid in the front row. “It’s mine!” shouts Morry, and puts the money back in his pocket, a nice illustration of some general business principle. The teachers are now frowning, but the kids are unable to preserve their original detachment. It’s time to talk politics. Morry’s positions are somewhat quixotic: he’s pro-choice (rousingly so, if asked), for the death penalty (ditto), against sending troops to Bosnia. No economics professor is a match for his dissection of Steve Forbes’s plan to cut the capital gains tax rate to zero. “I sold $15 million worth of stock to get into this thing,” he says. “I paid $5 million to Uncle Sam. Under Steve Forbes’s plan I wouldda paid nuthin. The guys who work for me would pay 17 percent on what they earn, and I would have paid no tax at all. And that’s wrong.” But even this is subordinate to his outrage at the inefficiency of our government. He’s running on a platform of balancing the budget in eighteen months not by eliminating programs but by firing a third of the best-paid government employees. Having balanced the budget he will then cut both programs and taxes. Tonight we flew in one of Morry’s private planes to a Republican county dinner at Storm Lake, in northwestern Iowa. It was held in a large warehouse disguised as a convention hall. Morry, who is sitting at the head table, pops up and beats the crowd to the buffet table, where he snags a fried chicken breast, green beans, mashed potatoes and an anemic-looking salad. Surveying the crowd upon his return he says, “This is going to be wild tonight. That guy at the end of the table—crazier than hell. He writes for the conservative paper. There’s going to be some smiles and some people pissed-off.” I point out that, out of 150 people, two have availed themselves of the cash bar. All the rest are drinking iced tea. “If you were a Democrat you’d have a lot more fun,” I say. And there, at a banquet filled with Republican Party hacks, the sort of people who are meant to be rabidly pro-life, who Morry expected to be rabidly pro-life, a volcano of spontaneous applause erupted. All over the room women were clapping so hard I thought they’d break their hands. Here, I thought, is the benefit of having someone around who feels free to speak his mind. He liberates, however momentarily, those who don’t. I was waiting at the front desk of the Des Moines YMCA when Morry arrived just before 9 a.m.: “What, you thought I wouldn’t show?” The racquetball game took just under twenty-two minutes. Morry won: 15-0, 15-5. I had figured that between the twenty-five extra pounds he’s carrying around and the sixteen years he has on me I could outhustle him. I was wrong. He knew every angle and trick on the court and played each one with relish. “Too good!” he’d shout after he’d dropped the ball into the corner for the tenth time. As the rout progressed he shouted to his aides—who had at length turned up—to come and watch. “Fourteen to zip, not bad for an old guy,” he shouted. And then, under his breath, “Some of my guys are betting on you. Dip shits.” As we crawl through the hole out the back of the court he says, “Don’t you go write that you lost because you were nervous the presidential candidate was going to have a heart attack.” Camus identified the love of winning at games as one of the prerequisites of happiness in the modern world. And he did that without ever meeting Morry. I went over to Titan Tire about an hour before the big debate—The Des Moines Register forum, it is called—and found Morry still in his sweat clothes with his feet up on his desk scratching out his two-minute closing statement. On the other side of his desk his campaign manager looks on with a mixture of affection and anxiety. “Hey,” Morry says when he sees me, “tell me what you think of this,” and over his manager’s protests he reads his remarks aloud. Half of it isn’t bad, but the other half is a series of wisecracks about Bob Dole that don’t seem to belong in a presidential debate. I offer my first strategic political advice: cut the Dole stuff, stress the unfairness of Forbes’s tax plan compared to his own by using his own experience and find a place to let people know that he’s pro-choice. His manager winces. The Taylor campaign feels the surest way to turn off Republican primary voters is to be loudly pro-choice, and its true that it didn’t exactly work for Arlen Specter. I make two points: (a) half the people at the Storm Lake event—party hacks every one—had to restrain themselves from leaping to their feet and cheering when Morry came out with his beliefs; and (b) it’s not as if Morry has any votes to lose. Outside the Des Moines television station there were two chanting mobs of about 200 people divided by a street. One held bright orange signs that said expose the right; the other jabbed signs for Dole, Gramm and Morry. I slid past and into the studio, where I presented myself as attached to the Taylor campaign. They signed me in but did not quite believe me—the woman insisted on walking me down to Morry’s studio. As we entered the back corridor we bumped into Morry on his way to the stage. He’s strutting. Both arms are swinging, and a cluster of six people are failing to keep up with him. Morry was seated exactly where he wanted to be, between Dole and Gramm. After the last debate, in South Carolina, he complained of being seated next to Keyes (“the guy nearly blew out my eardrums”). His situation facilitates one of his best lines, “I got a couple of million bucks of government pensions sitting on either side of me.” The studio loves it, but it was probably lost on the TV audience, since the camera keeps to tight shots of the candidates. No one has any idea who Morry is sitting next to. Very little separates the other candidates—it’s merely a matter of emphasis. Light grey and medium grey, as Morry put it. Keyes and Buchanan stress their pro-life message. All the other candidates except Morry agree or at least refuse to disagree. The exchanges feel tentative, provisional. It’s like one of those pick-up basketball games in which everyone who loses pretends he wasn’t trying. About midway through it becomes clear that only the spinners will be truly pleased. Because no one clearly won or lost, their job of clearing up the ambiguity for reporters becomes more important. Still, one thing is clear: how organic and fluid the process is. Every one of the candidates stands a chance of shaping future policy. Anyone who lands upon an issue and proves its electoral merit is likely to have his issue poached by the winner. If Morry succeeds in making Forbes’s tax plan look ridiculous, for instance, he will have struck one of the great blows for fairness, even though no one will remember his name. And he might: the other candidates are starting to pick up on his rap. “Time’s up, Mr. Taylor,” says the moderator. “Okay,” says Morry. He actually was going to do it, he tells me after the debate. But he’s too busy telling reporters about his racquetball triumph to spin his performance. I rush to the airport with one more bag than I came with to carry all the stuff Morry gave me: t-shirts, baseball caps, candy, literature. The American Airlines ticket counter is empty. As I stand there, up rushes a man who looks a little like Bob Dornan and asks if there are any seats left on the Chicago flight. He is Bob Dornan. B-1 Bob. The ladies behind the counter fail to recognize him. Dornan drops a hint: “I was just participating in the presidential debate,” he says. This means nothing to the women behind the counter, who have found a seat but are now demanding a ticket and identification, which Dornan can’t find. “I’m a congressman,” he says, as if this explains anything. The women fail to be impressed by this fact. “I think I won the presidential debate,” he says. They ignore him completely. It is a nice illustration of a general principle: if a celebrity falls in the woods and the witnesses do not know who he is, no one hears him. Finally I say, “You did really well,” which is only a slight exaggeration, and then explain to the ladies behind the counter who Bob Dornan is. His credibility skyrockets. They treat him as a big shot. You never can tell who might be president one day. Michael Lewis is a former senior editor of The New Republic. His latest book is The Big Short: Inside the Doomsday Machine (W.W. Nortion & Company).